Our second 'Review Award' goes to Chris Duffett. He richly deserves it for his lively, fun and very different blog called 'be the light'. A very special blog from a very special guy - both focussed on sharing Jesus. Chris lives within a few miles of me in the East of England. We've met several times but not as often as I'd like. His blog is called 'be the light'. The first time I went to visit him he was baking bread and we shared some straight from the oven with butter, cold meat and salad. Scrumptious! Chris is a baptist, meets with a local church in Bedfordshire, and is very active in sharing the good news about Jesus in some unusual ways. Visit the blog and you'll see exactly what I mean. 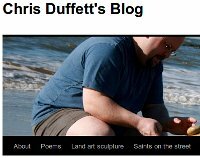 Why I like the blog - I have to say right away that the thing I most like is the sheer, abundant, happy life and energy of this site. And that is a good description of Chris himself. He describes some of his city centre adventures with us - always fun, always unexpected, always exciting. And he meets people everywhere he goes, making no distinction on grounds of appearance but blessing everyone in some very inventive ways. Another thing I love (and it has a lot to do with that inventiveness) is that he makes people think, he gets in 'under the radar' and touches hearts and minds. It doesn't work with everyone of course, but Chris doesn't give up or bear grudges or get disappointed. He just keeps on keeping on with a smile and a warm heart. Conclusion - We tend to be fairly inactive in sharing the good news with local people. There are probably many reasons for this, and one of them is lack of ideas. Most of us understand at a very intuitive level that handing out tracts or stopping busy people on the street is unlikely to be effective. But we don't know what else to try. We need something more arresting than a tract. Instead of stopping busy people we need them to choose to stop because they are puzzled or intrigued or amused. 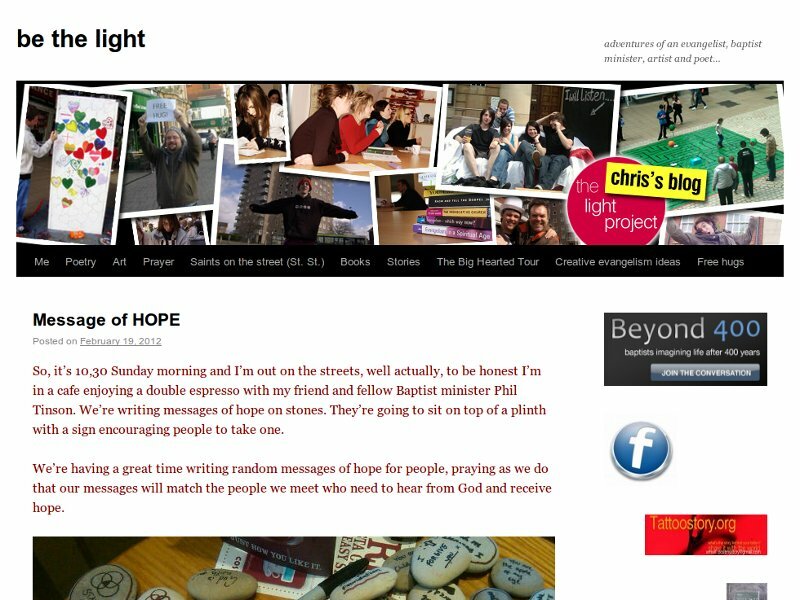 Chris's website 'be the light' is crammed full of ideas. What's more, they are all ideas that have been tested on the street. Chris's approach is not the only one open to us. But it is a useful component in our tool-kit. Don't forget the other tools including prayer, a compassionate heart, the day-to-day guidance of the Spirit, and the headship of Jesus. But armed with these (as Chris clearly is), any one of his ideas is likely to be fruitful. I've just been put in touch with a guy called Chris Duffett. He, his wife, and their three children live in a village not far from St Neots, we plan to meet up for lunch later this month. I've just taken a look at his blog - perhaps you should too! Chris is a man with a passion for reaching others. He wants them to hear the good news about Jesus. Not only that, he also has a passion for helping other followers of Jesus do the same. This is very healthy! Chris founded The Light Project and was its director for eight years. His blog is refreshing and is packed with encouraging and challenging stories. Then I saw a young man, cool skater rags and plenty of piercings. I felt that he was the guy I should pray for. A few minutes later I approached him and explained that I had felt God say that I should walk to the car wash and pray for someone with lower back pain. I asked if he was ok, and to be honest because of his age and ‘coolness’ I expected him to say yep, all was AOK. Yet he looked stunned and said that this was ‘remarkable’ as he had been to the chiropractor for lower back pain. I asked if I could pray for his back and he said ‘yes please,’ but later as he was late for college. Non the less Phil and I said a very quick ‘non eye closing- get on your knees kind’ of prayer and asked Jesus to heal him. The guy looked kind of shocked and I reassured him that God knew about him and his discomfort. What do you think of my story? Coincidence or God? Coincidence? I don't think so! The blog is fun to read but will also stop you in your tracks sometimes with an unexpected challenge or revelation. But why take my word for any of this? Click the links and take a gander yourself. I may post again after meeting Chris and spending some time with him.